Thus contradictory asymmetric war which took place between Israel and the Palestinian and Lebanese perlawana. A 3D Mk attempt to protect themselves by spreading the smoke from the engine exhaust when under attack army forces Palestinian stone throwers near Balata refugee camp, Nablus-West Bank. When it was first launched, Merkava directly used in the invasion of Lebanon in 1982. Great success achieved by destroying Syrian tanks. However, 24 years later in the same place, Merkava suffered a major defeat. What the hell is going on? In 1982, the Fatah faction which was then a small breakaway faction of the PLO (Palestinian Liberation Organization) did upava assassination of the Israeli ambassador to Britain, Shlomo Argov. In addition it is also an attack PLO Katyusha rockets into populated areas in northern Israel. Although there is no indication of involvement in the attack on the PLO ambassador, both of these events directly used as justification for Israel to expel the PLO from Lebanon, who was frequently staged bombings and rocket pencmbakan kc Israel from Lebanon. So on June 6, 1982, Israel launched government Mivtsa Shalom Hagalil (Operation Peace of the Galilee). In response to the command of such operations, the IDF sends dozens of F-16 and F-15 to carry out bombardment on the position of the PLO. While hundreds of Merkava Mk 1 tanks deployed in order to conquer the positions inaccessible airstrikes. Merkava Mk 1 which is when it really still gress spearheading armored almost every movement. On the road which is located on the waterfront, Merkava Mk 1 opens the road from Rosh Hanikra to Sidon, and Beirut Damur. Along the way, there are dozens of points retrofitting PLO dagger equipped AT-3 and RPG-7 giving Syria and the Soviet Union. 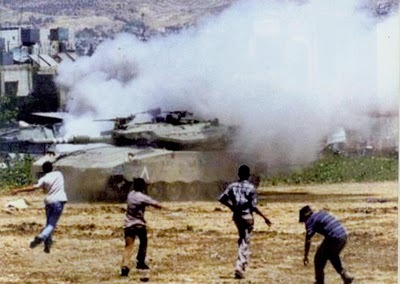 The journey was described by one Israeli tank commander sepcrti hell. "Almost every 100 meters PLO fighters fired RPG-7 from distance only 3-10 meters from the tank body, not including the shot with an AK-47 from RPK. Yet all attacks can not penetrate the Merkava armor. Few were able to blast effects pierce armor, it was not up to the inside so that the crew remained safe. " While in the eastern sector, formation Merkava direct stab movement with the support of the AH-1 Cobra helicopter. The goal is destroying Syrian forces Beka'a Valley. On the third day, a full-scale war with Syria erupts. Syria uses all its antitank weapons. Ranging from 105 mm recoiless rifle, TOW missiles, LAW 72 to AT-3. Various types of bullet caliber HEAT and APFSDS body hit the Merkava. Some were able to penetrate the layers of steel and machinery mcrusak. Thanks to the support from other tanks and crews repair damaged Merkava had been able to return to work less than a day. An incredible record at that time. The use of El-Op Fire Control System that is very accurate help Merkava to shoot the target with great accuracy at long distances. Plus the type APFSDS ammunition type "arrow", no armor that can withstand the ferocity Merkava 105mm cannon. Culmination of the fighting in the east occurred when the Merkava had face to face with a T-72 tank belonging Syria, Brigade 73. The tanks are equipped 125mm cannon, which was then the largest diameter tank cannon between MET world. The battle opened remotely. Merkava was able to shoot from a distance of 5,000 meters with an accuracy of topnotch, while the T-72 was barren for not having a laser range finder. As soon as the first shot is released, some T-72 instantly turned into a giant fireball. When the battle enters melee, range of antitank missiles helped both sides. Tertwata, at close range cannon 125 mm T-72 was not able to talk much. Only 3 or 4 Merkava actually damaged due to hit T-72 cannon. Finally, almost all T-72 Syrians killed, while the surrender, his tank be the spoils of war to be displayed as trophies. The defeat in the east makes the PLO and Syria surrounded to the west. Finally, only with the help of UN troops to Syria and the PLO from Lebanon in a state kcluar alive.